Everyone knows the story of Little Red Riding Hood . . . or so they think. That’s all about to change because no one has ever seen their favorite fairy tale quite like this -- turned upside-down, inside-out and reinvented as a computer-animated caper comedy that at last reveals the shocking true-crime investigation behind the legend. 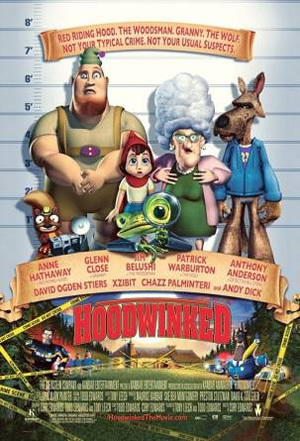 Hoodwinked is not your run-of-the-mill CGI family film, especially when it’s propped up against Pixar’s library. That’s not to say it does not share its similarities with the flurry of animated films from the past year. It resembles an irreverent style not uncommon with many, if not all films of this nature with its frenzied pacing, plenty of pop culture references and an impressive serving of Hollywood stars in its roster. Certainly not as polished as its esteemed predecessors, it manages to waylay its audiences with a novel style of storytelling not yet seen in this genre. You might have heard of Akira Kurosawa’s Rashomon, the 50s masterpiece that introduced an innovative concept that rekindled the art of reconfiguring a story’s narrative. Using multiple flashbacks of different key characters, it urges the viewer to attempt to recreate a story - the true story. Or perhaps, you might be more familiar with Quentin Tarantino’s own take on this approach in his cinematic bow with Reservoir Dogs. Hoodwinked uses this very style shamelessly. You could even call it a gimmick. It really does not improve on this type of storytelling other than giving it a humourous and fun twist. 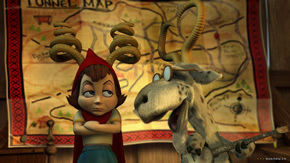 The fairy tale of Little Red Riding Hood and her encounter with the wolf is the basis of this particular film. 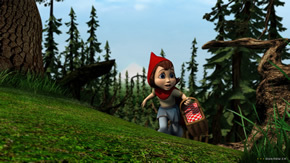 It is told and retold from various perspectives, which includes Little Red (Anne Hathaway), Granny (Glenn Close), The Woodsman (Jim Belushi) and The Wolf (the ever reliable, Patrick Warburton). Other than the usual suspects, there are also various other characters that are specially enclosed in the film’s world, which is filled to the brim with smart-talking woodland creatures and other manic personalities that’s somehow reminiscent of downtown Los Angeles. Reinvented as a crime caper, the film starts with an inciting incident that lead the inept police squad and a Sherlock Holmes-esque frog to investigate its apparent connection to a string of high-profile recipe thefts by somebody called The Goody Bandit. 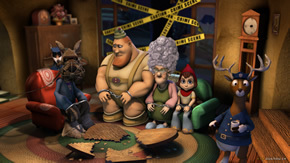 As Granny’s house is cordoned off, the interrogations reveal flashbacks by each character, as some manage to overlap the other accounts showing why and how each character ended up at the crime scene. Hathaway’s performance is perfunctory at best. She does not bring any more humour or sass into the role than the script would have originally intended. As a singular character, she pales in comparison with the entirety of the cast, which is nothing short of a delight. With the film’s cheeky attitude (sort of like a Simpsons episode) and a tone that is unabashedly American, its veteran voice actors are pivotal in bringing their characters’ some sense of posterity in CGI animation’s swiftly filling library. The execution of the flashbacks is not necessary brilliant but it is well done. It’s an amusing device that’s aided by various character interactions along the way. Episodic in nature, it moves the story along fairly quickly and its frivolity makes sure the story is understandable and the film’s whodunit plot thread is probably a little too thin to be taken seriously. You won’t find any missing gaps in the plot or wild suppositions - expect everything to be laid out on a plate for you before the credits roll. What the film could have done without is its musical numbers. Inspiration-less and devoid of any sort of wit, each song feels out of place in a supposedly high-concept alternative to the typical family fare. If you can look beyond the film’s relatively modest animation that makes the characters look like porcelain dolls, you will find a fresh take on an age-old fairy tale. 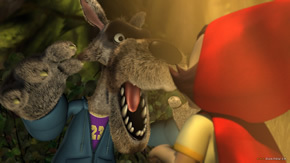 Not joining the pantheon of its CGI brethren like Shrek or The Incredibles where their stories were matched by its refined technical detail as well as a rapier wit, Hoodwinked is still far from mediocre and a great film for the family.